river and found Father very uncomfortable. We did all we could to relieve him. I came home at 4.20. Will had been to a sale. We were tired and went to bed early. I wrote Lydia today. 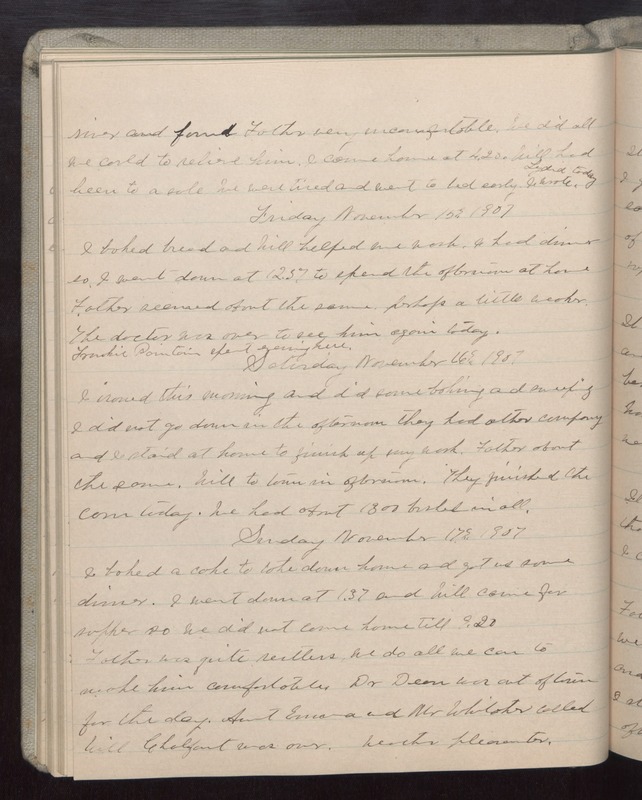 Friday November 15 1907 I baked bread and Will helped me wash. I had dinner so I went down at 12.37 to spend the afternoon at home Father seemed about the same, perhaps a little weaker. The doctor was over to see him again today. Frankie [Pointoin?] spent evening here. Saturday November 16 1907 I ironed this morning and did some baking and sweeping I did not go down in the afternoon They have other company and I staid at home to finish up my work. Father about the same. Will to town in afternoon. They finished the corn today. We had about 1300 bushel in all. Sunday November 17 1907 I baked a cake to take down home and got us some dinner. I went down at 1.37 and Will came for supper so we did not come home till 9.20. Father was quite restless we do all we can to make him comfortable. Dr Dean was out of town for the day. Aunt Emma and Mr Whitaker called Will [Chalfont?] was over. Weather pleasanter.